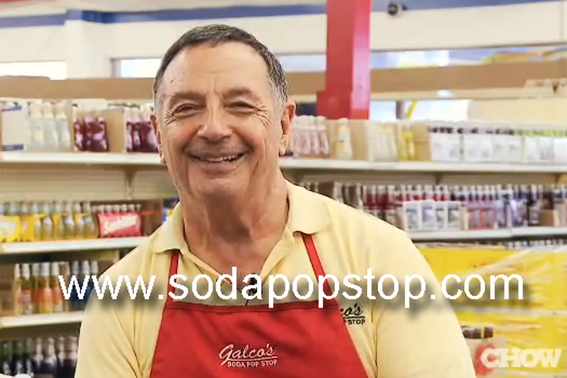 “I don´t work, I just play all day long.” 13 minutes of your live for the man, who offers the freedom of choice for sodapopbottles, people never had heard before. 1961 London Bus with “SSSCHWEPPESSS” advert. 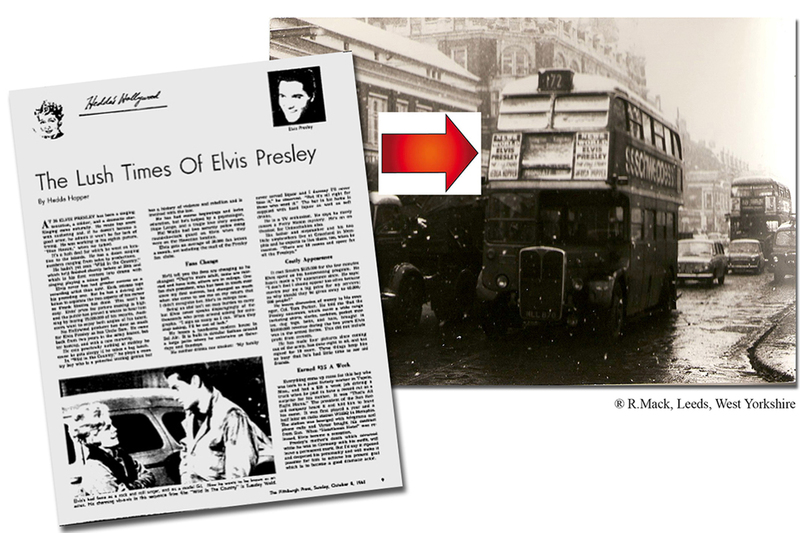 Headline “Elvis Presley, the full story by Hedda Hopper”. HH (May 2, 1885 – February 1, 1966) was one of America’s best-known gossip columnists. Hopper continued to write gossip to the end, her work appearing in many magazines and later on radio. Torpedo bottles, egg bottles, pointy enders, ovates, ballast bottles or bombs are often called mistakenly HAMILTON bottles. 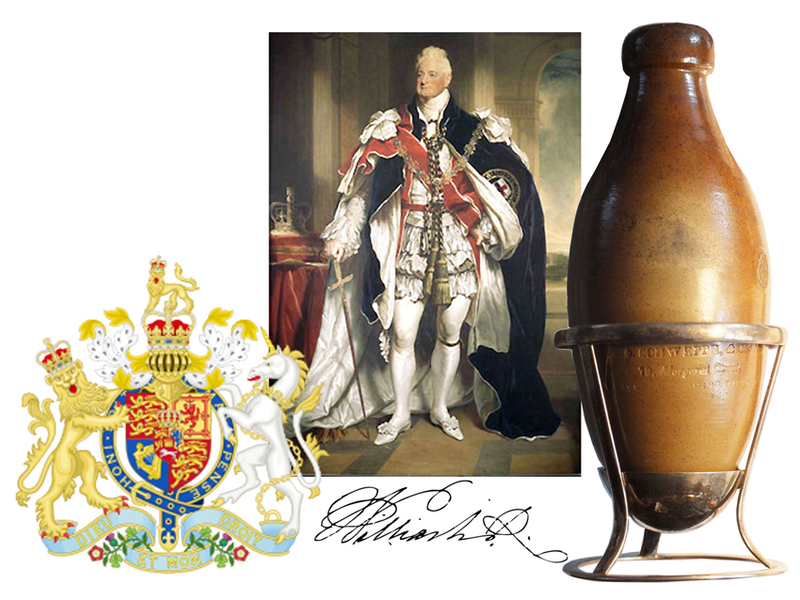 Named after William Francis Hamiltons embossed “Patent-Bottle” 1809 ff. 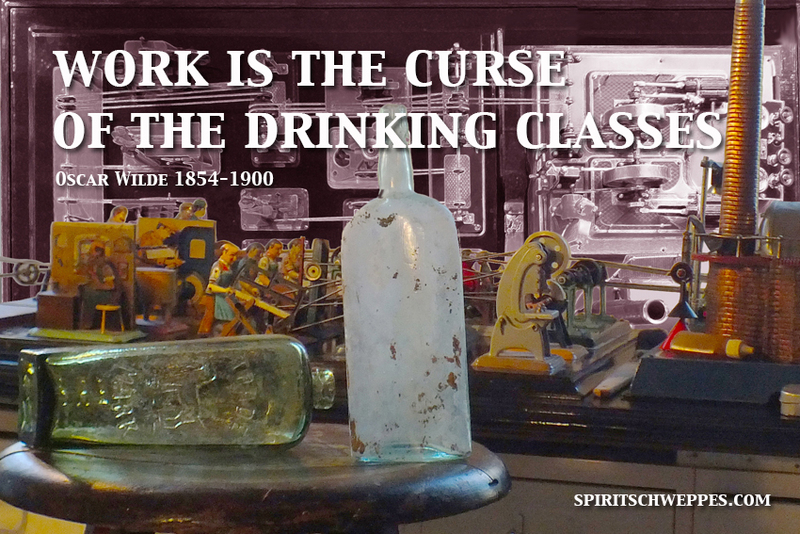 He lived in Lower Mount Street in the City of Dublin and granted a Patent in 1809 “for a new Method of preparing Soda and other Mineral Waters…” – but definitly not for the special type of bottles, who could not stand up on their own. 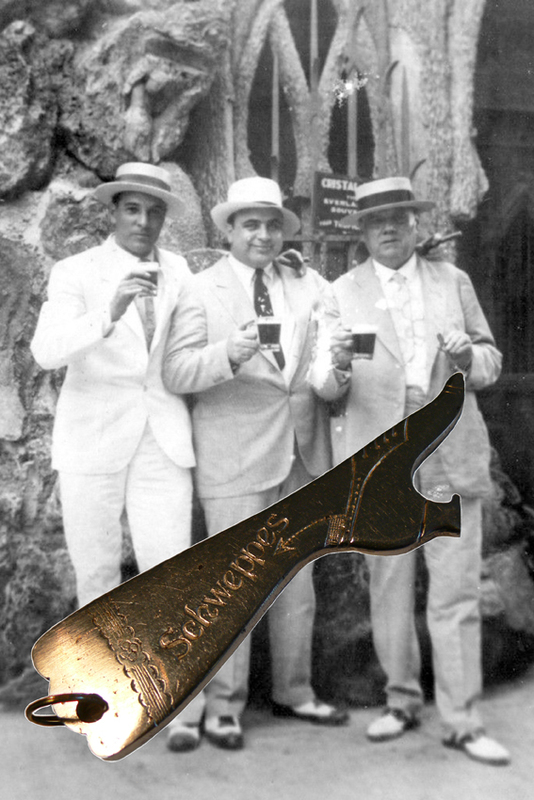 It is generally accepted, that JACOB SCHWEPPE was the industrial inventor of soda water and the first mass producer of Torpedo Bottles. 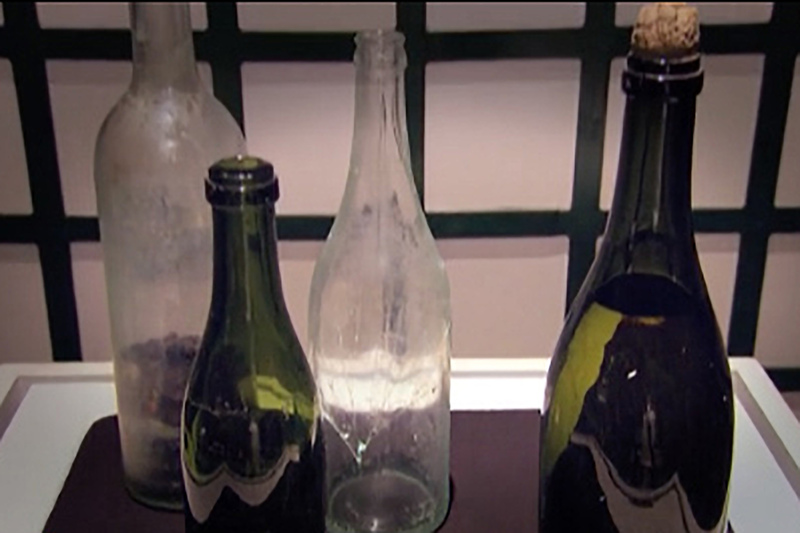 He moved to London in 1792 and used egg shaped bottles until the turn of the century 1910. 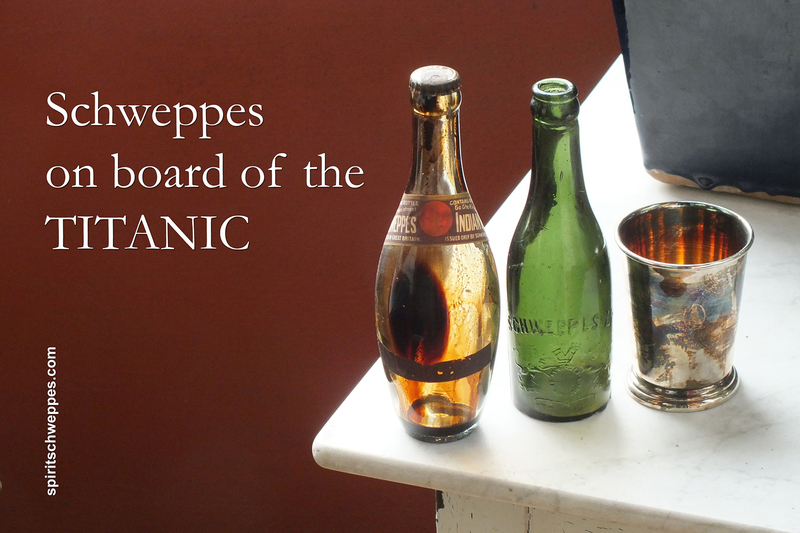 His earliest Torpedo Bottle was a pottery or stoneware bottle, the SCHWEPPES NO 1, followed from the pointilled Glass-Bottle “Margaret Street” from 1795 – 1831. 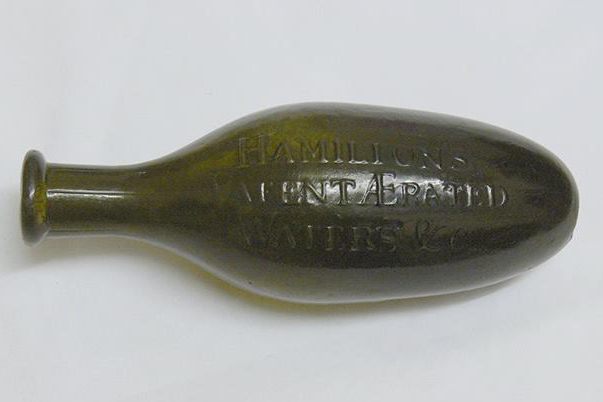 Thank you David Walker Barker, Leeds/GB, for your example of the authentic Hamilton Patent Bottle, “Hamiltons Patent Aerated Waters” circa 1825 – 1830. Vintage Schweppes skittle bottle 180mm tall with a base diameter of 45mm. 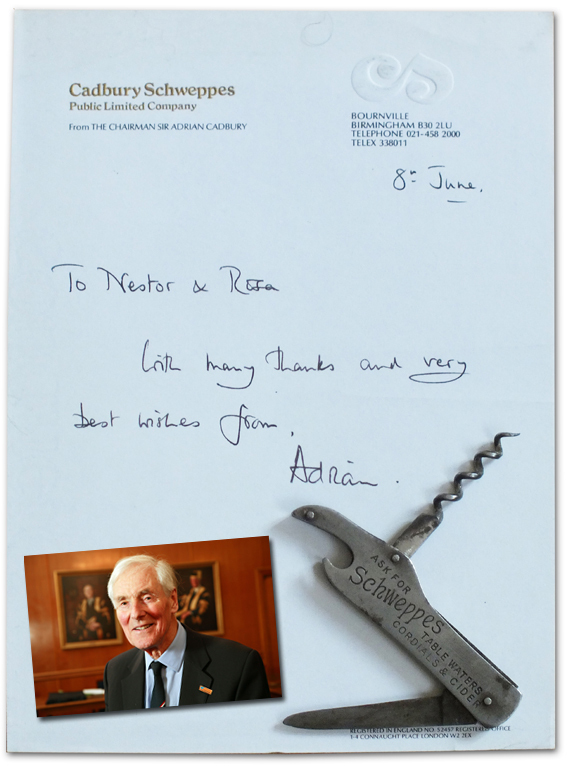 It has embossed on the front ‘SCHWEPPES’ and on the back the Royal Crest and underneath ‘ BY APPOINTMENT’. On the base is embossed the bottle’s manufacturer ‘K.B.LTD G 143’. 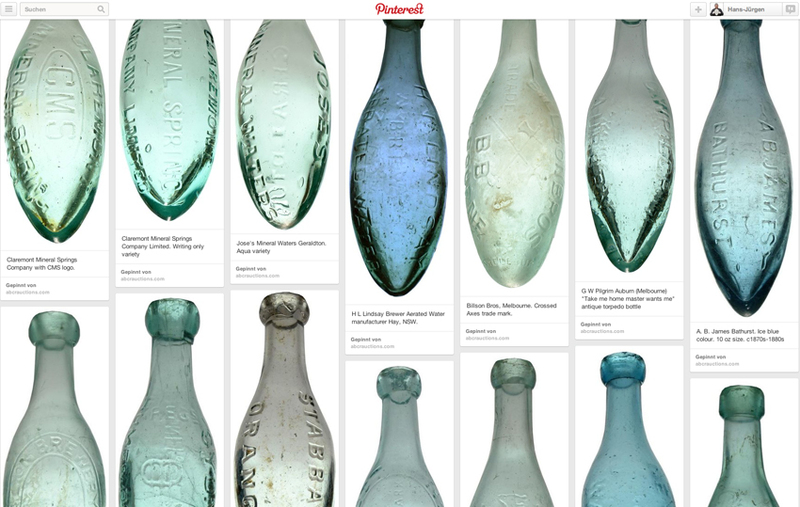 This was Kilner Bros Ltd and they manufactured bottles from around 1870 until 1922, based in Thornhill Lee’s West Yorkshire. 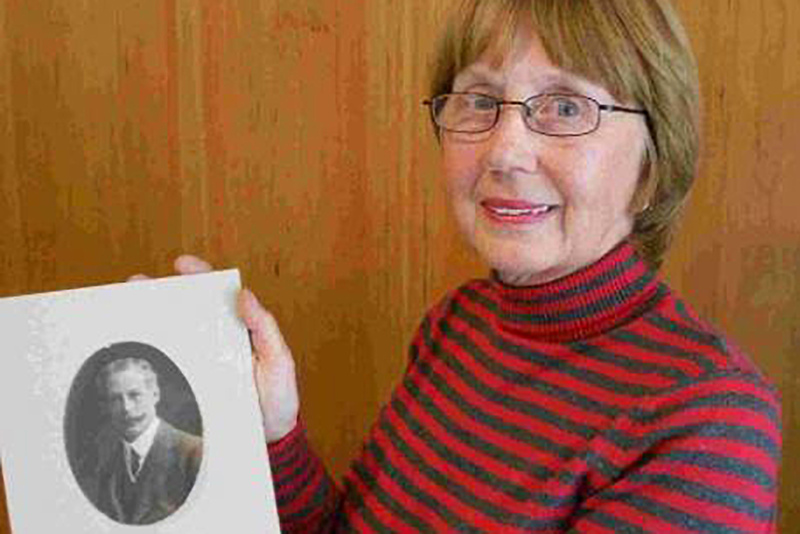 This article was published by the Dewsbury Reporter in their Men of Science supplement: …Some idea of the magnitude of the operations carried out can be gathered from the fact that the firm employed seven commercial travelers and 600 workers. By this time the Kilners had also opened another extensive works in Conisborough which employed a further 500 workers. 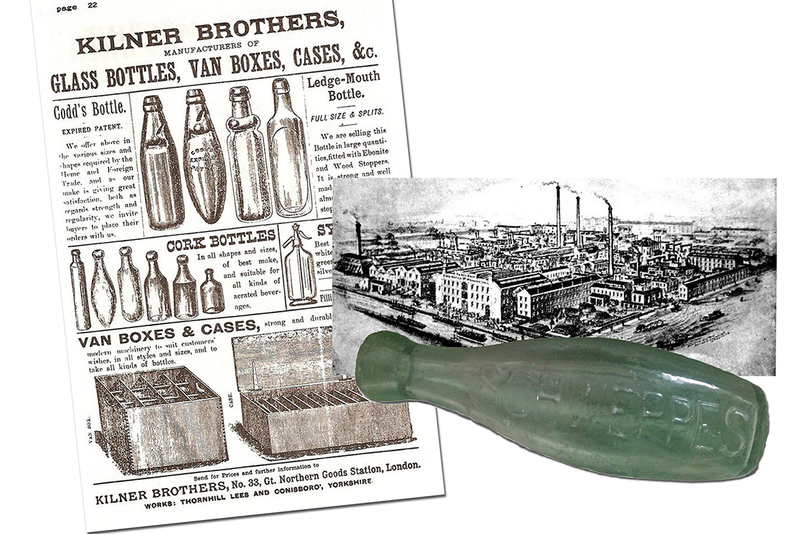 For many years Kilners held a leading position in the trade, and were patentees of a system for making the rims of bottles and jars one uniform size so they could be fitted with tin caps.. 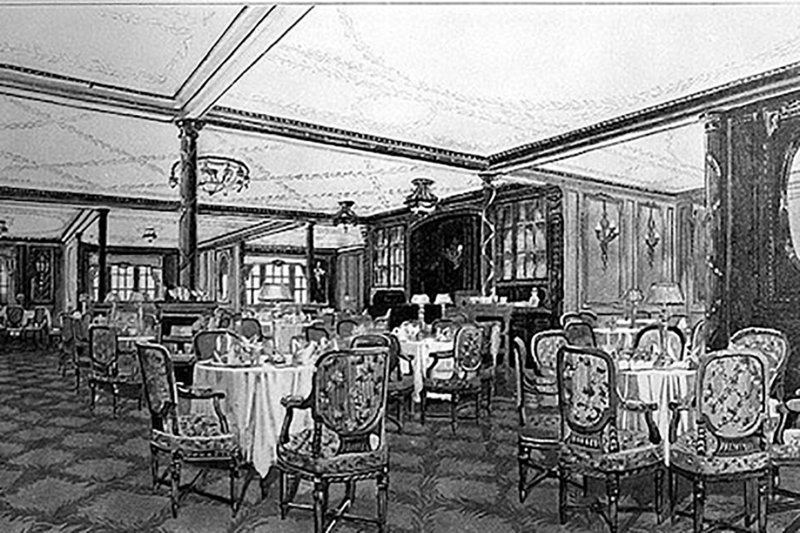 The R.M.S. 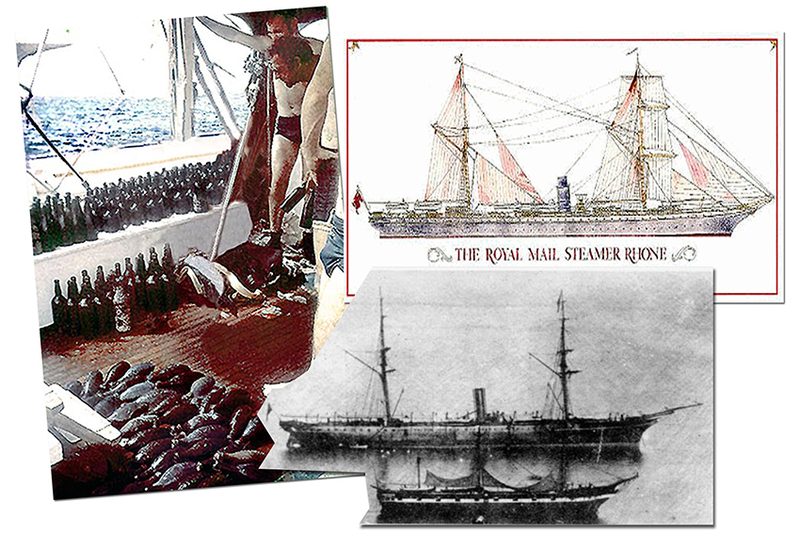 Rhone was part of the Royal Mail Steam Packet Company which provided services between England, Caribbean and South America. 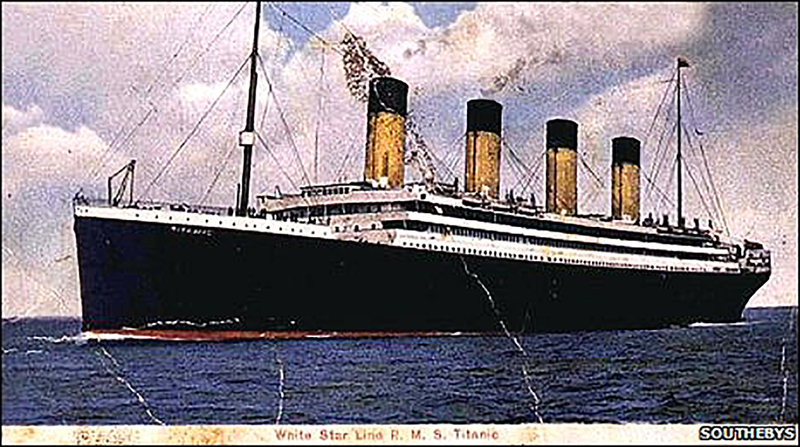 It was a high-class vessel with a short career. In 1867 she was one of about 75 vessels damaged or lost in a hurricane. 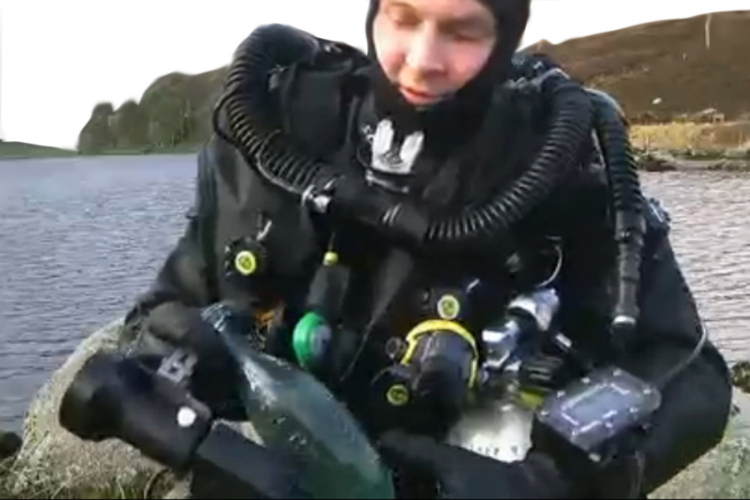 Hundred years later, Bert Kilbride, a diver known as “The last Priate of the Carribbean”, lifted a treasure of egg bottles, filled with genuine (Schweppes?) mineral water. Today, the wreck is one of the most popular dives in the British Virgin Islands. 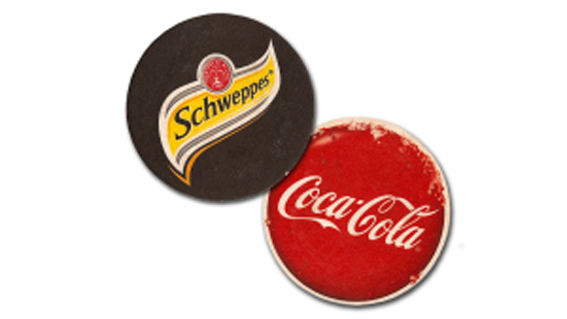 the term “soft drinks” was originated to distinguish the flavoured drinks from hard liquor or spirits. 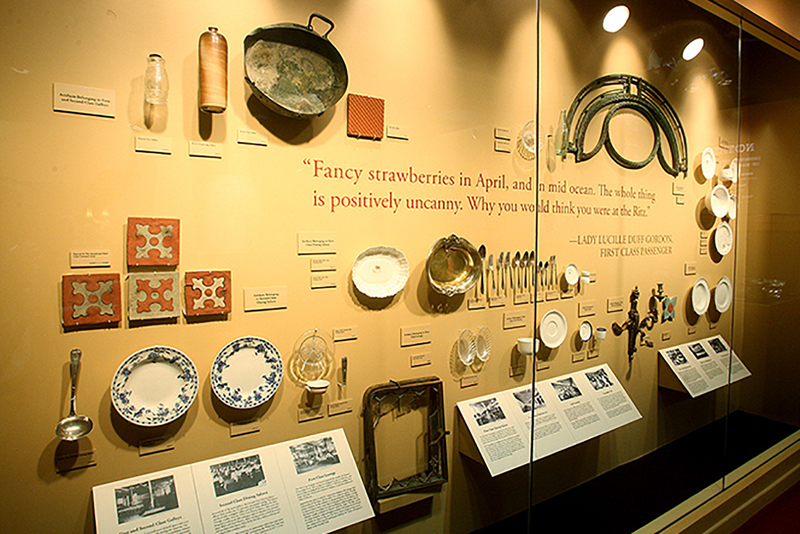 Soft drinks were recommended as a substitute in the effort to change the hard-drinking habits of the English and early Americans. 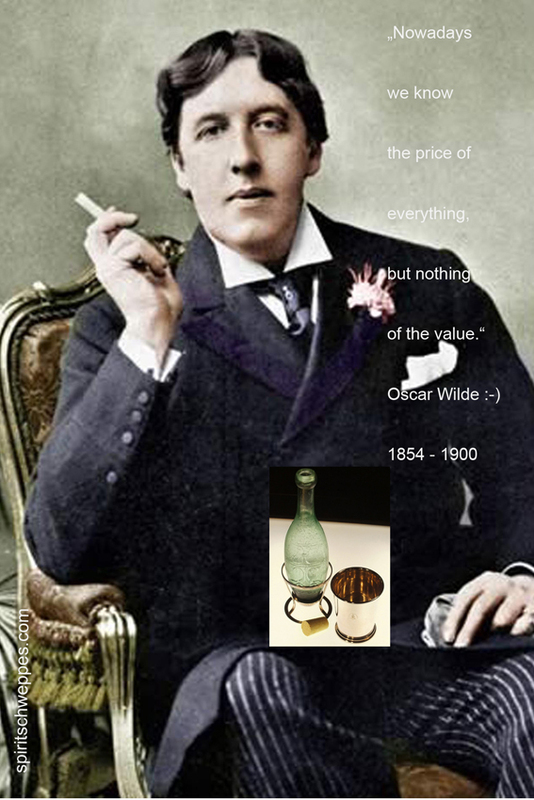 in full Oscar Fingal O’Flahertie Wills Wilde (born Oct. 16, 1854, Dublin, Ire.—died Nov. 30, 1900, Paris, France), Irish wit, poet, and dramatist whose reputation rests on his only novel, The Picture of Dorian Gray (1891), and on his comic masterpieces Lady Windermere’s Fan (1892) and The Importance of Being Earnest (1895). He was a spokesman for the late 19th-century Aesthetic movement in England, which advocated art for art’s sake, and he was the object of celebrated civil and criminal suits involving homosexuality and ending in his imprisonment (1895–97). (born Dec. 16, 1775, Steventon, Hampshire, Eng.—died July 18, 1817, Winchester, Hampshire), English writer who first gave the novel its distinctly modern character through her treatment of ordinary people in everyday life. 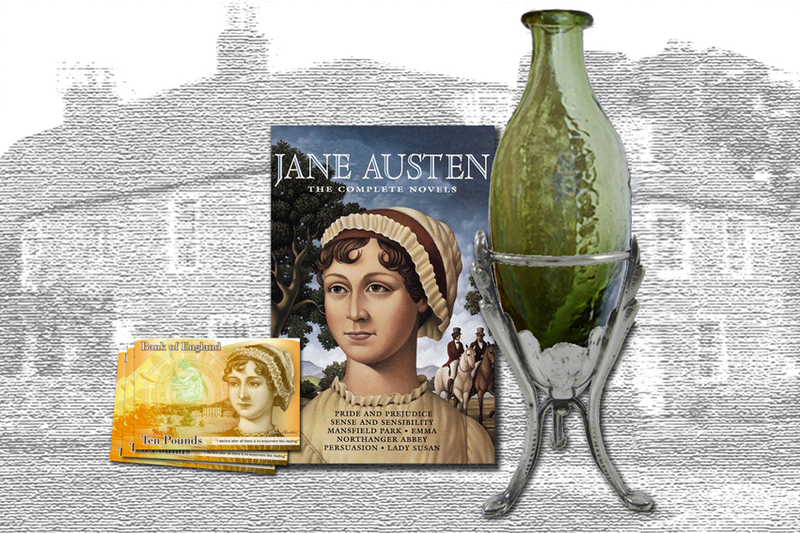 Austen created the comedy of manners of middle-class life in the England of her time in her novels, Sense and Sensibility (1811), Pride and Prejudice (1813), Mansfield Park (1814),Emma (1815), and Northanger Abbey and Persuasion (published posthumously, 1817)…. 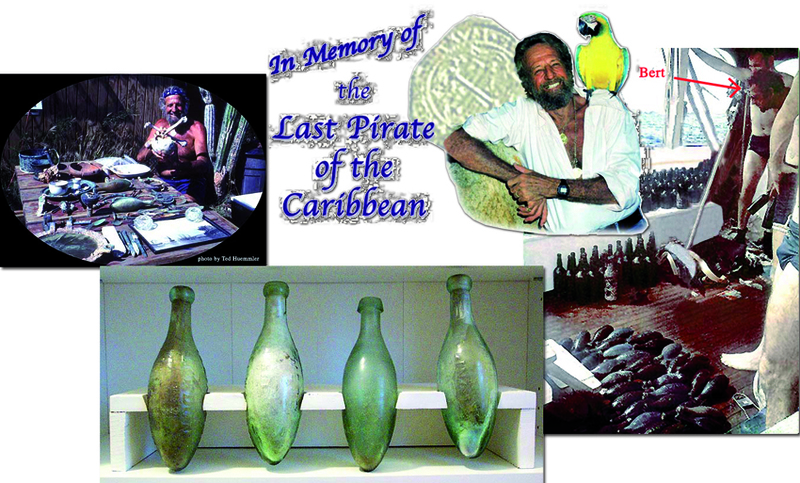 “I have been a treasure seeker around the British Virgin Islands for over 5 decades where I resided from the 1950´s through 2005. I have charted (in my head) 138 ship wrecks. My mom taught me to swim before I could walk and I hhave been a diver for almost a century now. ” On January 8, 2008, his heart and kidneys were 94 years old and just couldn´t support him any longer. in full Alexandrina Victoria (born May 24, 1819, Kensington Palace, London,England—died January 22, 1901, Osborne, near Cowes, Isle of Wight), queen of the United Kingdom of Great Britain and Ireland (1837–1901) and empress of India (1876–1901). She was the last of the House of Hanover and gave her name to an era, theVictorian Age. During her reign the English monarchy took on its modern ceremonial character. also called Prince William Henry, Duke Of Clarence (1789–1830), GermanWilhelm Heinrich, byname The Sailor King (born Aug. 21, 1765, London—died June 20, 1837, Windsor Castle, near London), king of Great Britain and Ireland and king of Hanover from June 26, 1830. In 1831, the Post Office Directory recorded J.Schweppe & Co. as “Soda and Mineral Water Manufacturers to Their Majesties and the Royal Family”. 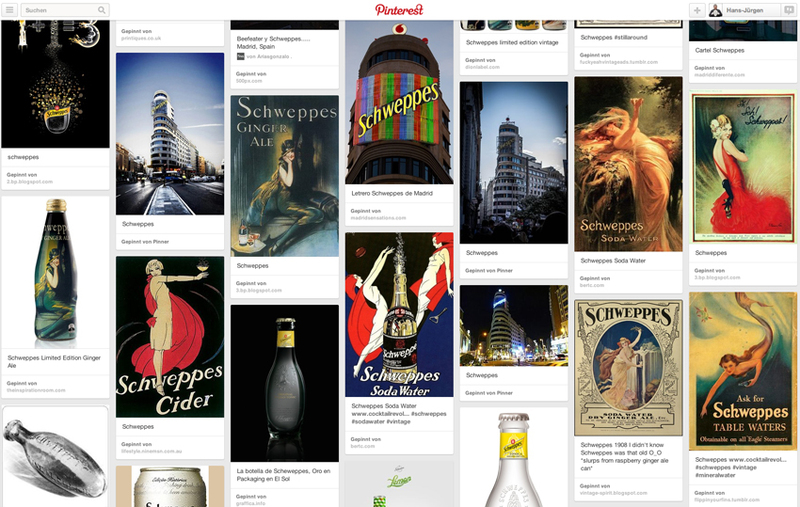 In the British Imperial Calendar for 1833, J.Schweppe is listed as purveyor of soda water to His Majesty´s Household. in full Charles John Huffam Dickens (born February 7, 1812, Portsmouth, Hampshire, England—died June 9, 1870, Gad’s Hill, near Chatham, Kent), English novelist, generally considered the greatest of the Victorian era. 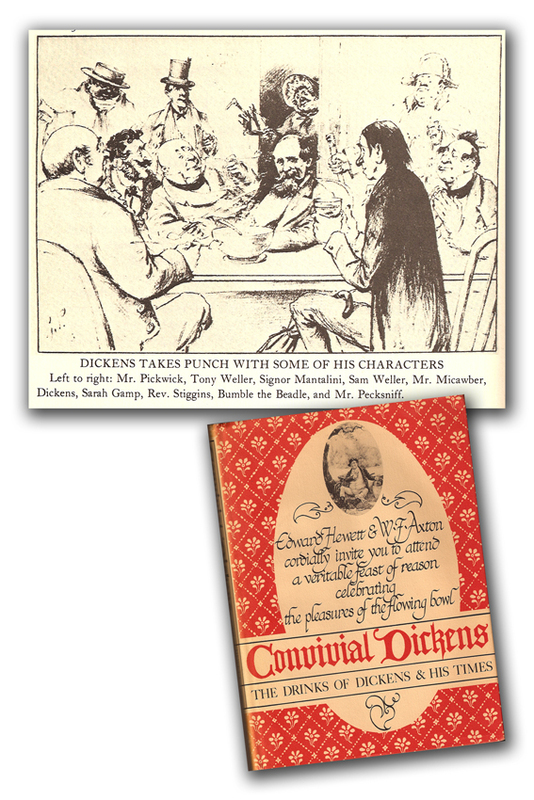 His many volumes include such works as A Christmas Carol, David Copperfield, Bleak House,A Tale of Two Cities, Great Expectations, and Our Mutual Friend.Dickens enjoyed a wider popularity than had any previous author during his lifetime. 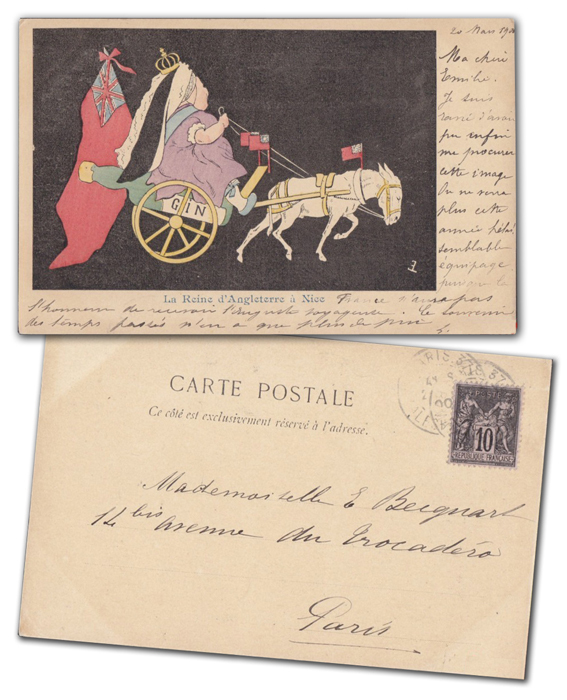 Much in his work could appeal to simple and sophisticated, to the poor and to the queen, and technological developments as well as the qualities of his work enabled his fame to spread worldwide very quickly. byname of Alphonse Capone, also called Scarface (born Jan. 17, 1899, Brooklyn, N.Y., U.S.—died Jan. 25, 1947, Palm Island, Fla.), the most famous American gangster, who dominated organized crime in Chicago from 1925 to 1931. In the prohibition-year 1927, Capone and his gang were pulling in approximately $60 million per year- most of it from beer. 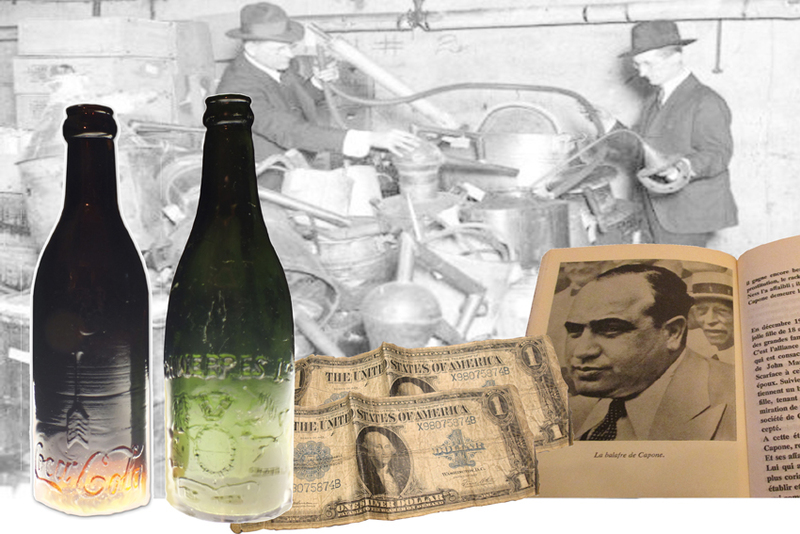 Capone not only controlled the sale of liquor to over 10,000 speakeasies, but he also controlled the supply from Canada to Florida. 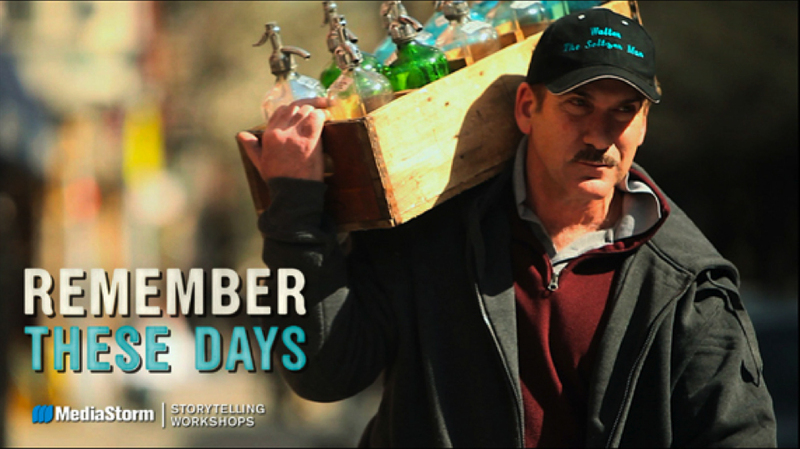 this bottle is unique and one of the most storytelling items of my collection. A rare leather and glass flask from the prohibition era. It is signed on the bottom Dr. Thy M Emery and has the date August 1929. It also has an inscription by Dr. Emery that reads: “The Shot How Big I say. How I meant it then. I know now.” The front of the flask reads: Shasta Springs, Cal./You can’t Fool Nature!/Prohibitionists have Red Noses and Will Tell you Where to fill Flask./August 1929. The other side reads: Drink Meter/Directions/Take Internally/One Drink Freezing/Two Drinks Moderating/Three Drinks Fair and Warmer/Four Drinks Hot and Sultry/Empty Cyclone/Thunder and Lightning. Measures 5 1/2″ x 1 1/2″ x 3 1/2″. A great piece of history, which has survived Dr. Emery. dr. Emery would have used “recipes” like this. A original government issued Prohibition Prescription for Spirits Frumenti, the US pharmaceutical term for Whiskey, 2 fluid ounces every 3 times daily! 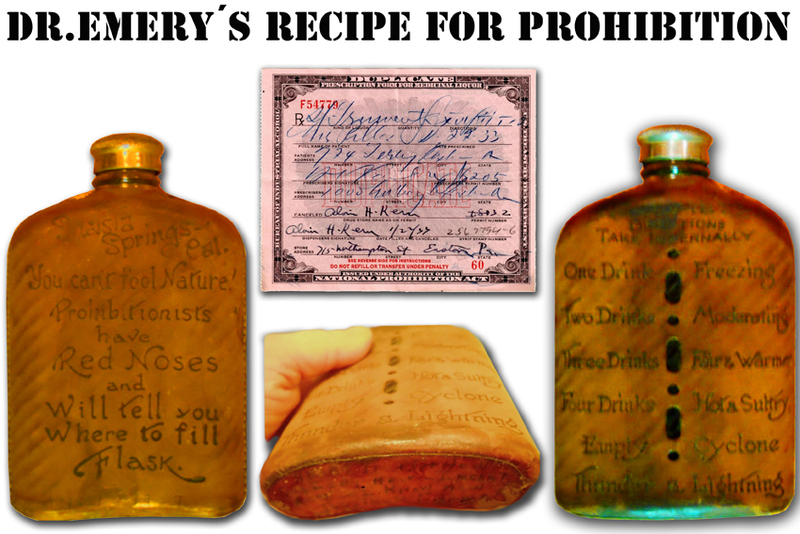 From the days of Al Capone, flappers and moonshine this prescription was the only legal way to drink liquor in the US! The whiskey was prescribed for Mrs. Pilles, by Dr. Raub, on January 22, 1933, and was filled the same day by Pharmacist, Alvin H. Kern, of Easton, PA. It was issued by the Treasury Department and is printed on, beautiful pink paper. In the center is the old Treasury Seal with the Latin inscription, “Thesaur. Amer. Septent. Sigil.”. 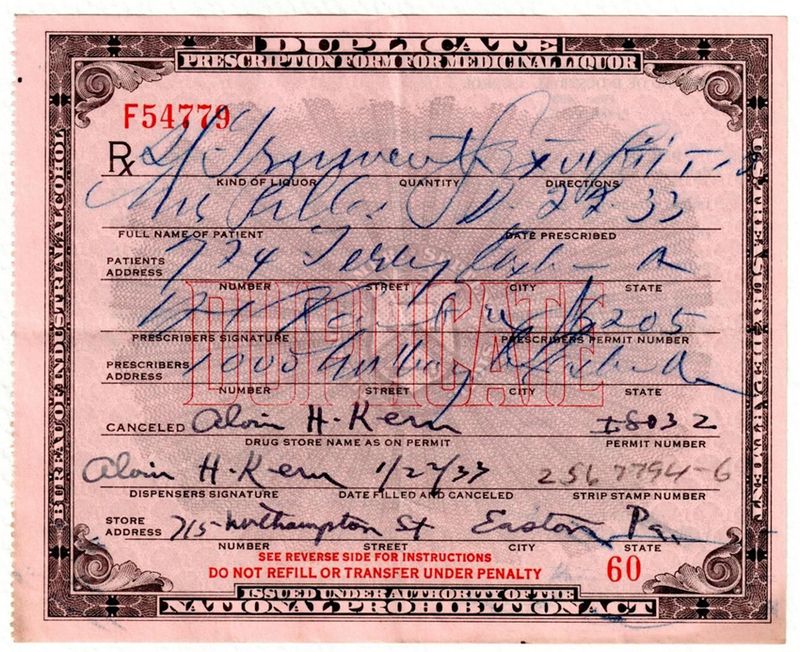 When you hold this prescription up to the light PROHIBITION is watermarked, as with the metal strips that are used in U.S. bills today. This was the pharmacist’s duplicate copy, printed on the back are the “Instructions”, one of which is: “This duplicate prescription must be retained by the druggist as permanent record, open to inspection by Federal Officers”, the top copy was sent to the government. The prescription measures 5 1/2″ x 4 1/2″. Thank you Grace from New Jersey for your great research! Winds of change. 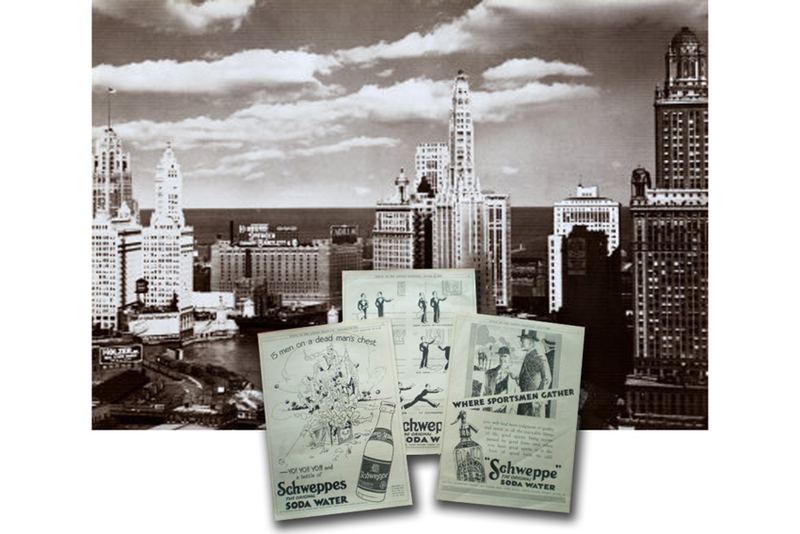 In 1983, Schweppes marked his 200th bicentenary with “Schweppes – the first 200 years”. 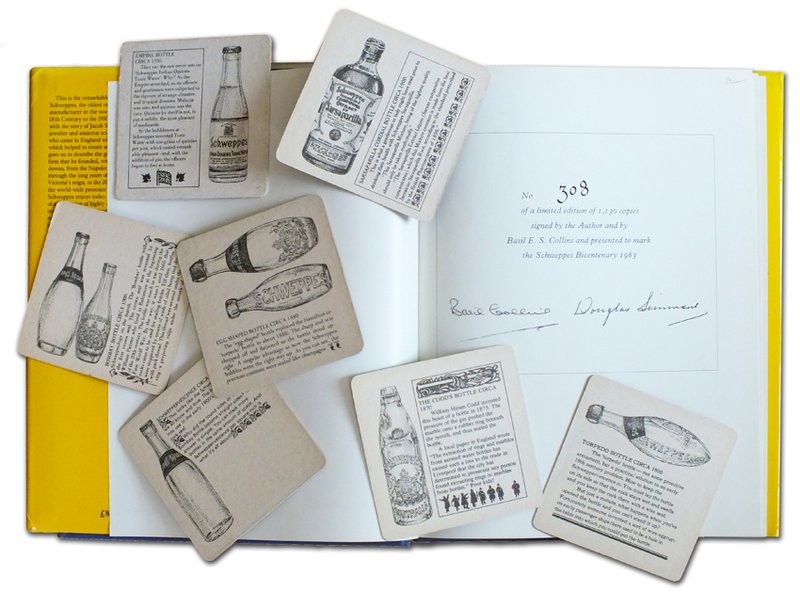 Here is one of 1130 copies worldwide, signed by the author Douglas A.Simmons and Basil E.S.Collins of Cadbury-Schweppes. Accompanied by product-milestones on australian beermats. 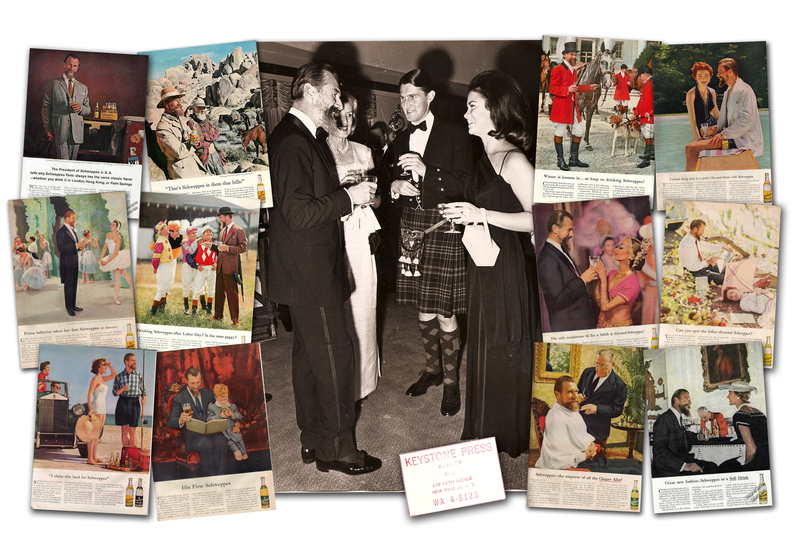 Chairman for 24 years was Sir George Adrian Hayhurst Cadbury (born 1929), a former British Olympic rower. 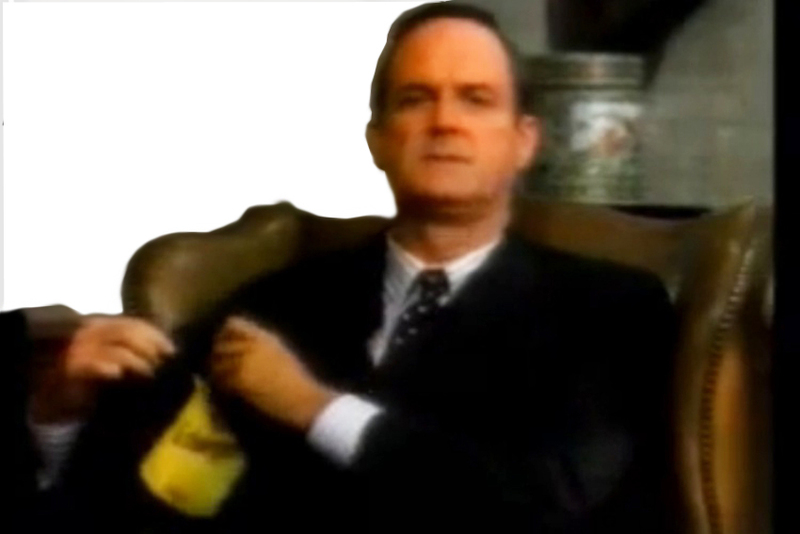 He managed Cadbury/Schweppes (established 1969) as a central operated global brand. Since 2006, the brand is managed nationwide by concessionary companies. Heute schon wieder auf der Seite geschweppt! 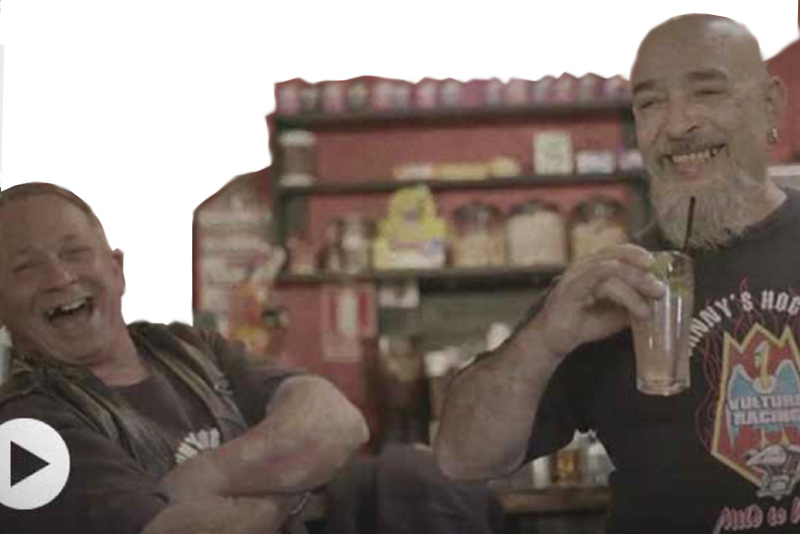 Gute Geschichten, gute Sammlung, ich wünsche weiter viel Erfolg!